Nothing preoccupied the mind of an Edwardian hostess so much as the planning of a dinner party. From matters of food and drink, table service, the guest list, and matters of precedence, every detail was of the utmost importance. A dinner of tepid or cold food, of dull guests, and of seating arrangements that did not take the rank and form of each guest into account could doom a lady’s social aspirations in one evening. 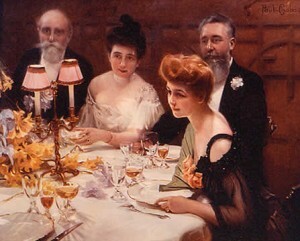 Since dinner giving was the most important of all social observances, gentlemen and their wives held them much more frequently than balls or other social occasions; a dinner was considered more intimate, and invitations were sent to those one was intimate with or with those the host and hostess hoped to become intimé. In the greater scheme of the inner workings of society, a dinner party was both a test of the hostess’s position and the direct road to obtaining a recognized place in society. 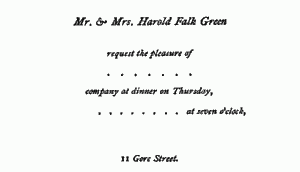 The dinner hour was approximately eight to nine, and guests were expected to appear at least fifteen minutes prior to the time listed on the invitation. The long, slow, and heavy meals of the mid-nineteenth century had disappeared by the Edwardian era: now hostesses preferred their dinner parties swift and filling (though this was taken to the extreme by Gilded Age hostess Mrs. Stuyvesant Fish, who would hurry her guests through eight or nine courses in forty minutes), most likely to make time for evening entertainments. On arrival, ladies and gentlemen would take off their cloaks in the cloakroom or leave them in the hall with the servant before entering the drawing-room, where the host and hostess awaited them. The vogue for pre-dinner cocktails was strictly an American custom until about 1910, and once the host and hostess greeted each guest, the ladies sat and the men stood, chatting lightly until the last guest had arrived. If any parties were unacquainted, the hostess would introduce the guests of the highest rank to one another. At very large dinner parties, however, the butler was stationed on the staircase and announced the guests as they arrived, and no introductions were required. 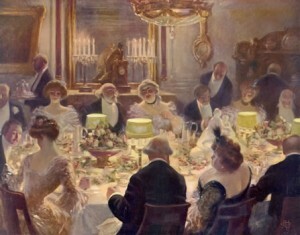 According to Arnold Palmer’s Moveable Feasts: Changes in English Eating Habits, the custom of pairing off to go in for dinner did not begin until early in the reign of William IV, and this was refined throughout the nineteenth century until it morphed into its usual form: The host would take the lady of the highest rank present in to the dinner, and the gentleman of the highest rank took in the hostess. This rule was absolute, unless the highest ranking male and female were related to the host or hostess, in which case his or her rank would be in abeyance, out of courtesy to the other guests. Another don’t was for a husband and wife, father and daughter, or mother and son, to be sent in to dinner together. The hostess was advised to invite an equal number of men and women, though it was usual to invite two or more gentlemen than there were ladies, so that married ladies would not be obligated to go in to dinner with each others’ husbands only. Should the numbers be skewed, if there were more women than men, the ladies of highest rank would be taken into dinner by the gentlemen present, and the remaining ladies followed by themselves. In there were more men than women, the hostess would go in to dinner by herself, following the last couple. Prior to entering the dining room, the hostess would inform each gentleman whom he would take in to dinner. The host remained standing until the guests had taken their seats, and he motioned to each couple where he wished them to sit. When the host did not indicate where the guests were to sit, precedence took over, and each lady and gentleman sat near the host or hostess according to their rank. The host and the lady he took in to dinner sat at the bottom of the table, she sitting at his right hand. The hostess sat at the top of the table, and the gentleman who brought her in to dinner sat at her left. According to precedence, the lady second in rank sat at the host’s left hand, and the other female guests sat at the right of the gentleman who took her in to dinner. Place cards with the names of each guest were used at large dinner parties, and in some instances, the name of each guest was printed on a menu and placed in front of each cover. The menus themselves were placed along the table, each viewable by one or two persons. These menus could be simple or elaborate, depending on the hostess’s tastes, and the dishes available in each course were written in French. For table decoration, there were a number of variations available, though they were largely a matter of taste than of etiquette. The basic table setting was of a mixture of high and low center pieces, low specimen glasses placed the length of the table, and trails of creepers and flowers laid on the tablecloth. The fruit to be eaten for dessert was usually arranged down the center of the table, amidst the flowers and plate. Some dinner tables were decorated with a variety of French conceits (centerpieces), whilst others were sparse, save for the flowers and the plate. Lighting was an important feature, and though electric lights were in vogue when possible, it was not uncommon to dine by old-fashioned lamps and wax candles. Accompanying the decorations and lighting was the “cover,” which was the place laid at the table for each person, and consisted of a spoon for soup, a fish knife and fork, two knives, two large forks, and glasses for the wines being served. Dinner-table etiquette was strict–an uneducated or uncouth person who appeared innocuous enough, would reveal his or her inexperience in a finer milieu by displaying such shocking customs as eating off a knife, or tucking a napkin into the collar of their shirt. When a lady took her seat at the dinner table, she removed her gloves at once, though were long gloves, they were usually made to allow the glove to be unbuttoned around the thumb and peeled back from the wrists. Both ladies and gentlemen would unfold their serviettes and place them in their laps. Soups were, of course, eaten with a soup spoon, though one spooned away from themselves and never ever slurped. Fish was eaten with the fish knife and fork, and all made dishes (quenelles, rissoles, patties, etc) were eaten with a fork only. Poultry, game, etc were eaten with a knife and fork, as was asparagus and salads. Peas, the test of true breeding, were eaten with a fork. In eating game or poultry, the bone of either wing or leg was not touched with the fingers; the meat was cut from the bone with the knife. Jellies, blancmanges, ice puddings, and practically any substantial sweet, were eaten with a fork. Cheese was eaten daintily, with small morsels placed with the knife on small morsels of bread, and the two conveyed to the mouth with the thumb and finger. When eating grapes, cherries, or other pitted fruits, they were brought to the mouth, whereupon the pits and skins were spit discreetly into the hand to be placed on the side of the plate. Dessert was served to the guests in the order in which dinner was served. When the guests had helped themselves to the wine and the servants had vacated the dining room, the host would hand the decanters around the table, starting with the gentleman nearest him, as ladies were not supposed to require a second glass of wine during dessert. If she required a second glass, the gentleman seated beside her would fill the glass–she would definitely not help herself to the wine. Ten minutes or so after the wine had been passed once around the table, the hostess gave a signal for the ladies to leave the dining room by bowing to the lady of the highest rank present. The gentlemen rose when the ladies did, and the women quit the dining room in the order of their rank, the hostess following last. The gentlemen were left to their port and claret, while the ladies retired to the drawing room for coffee. While the ladies drank their coffee, a servant took the coffee to the gentlemen, and after a few more rounds of wine and the cigarettes and cigars were smoked, they joined the ladies. This custom, however, shortened by 1910 or so, and at times, the practice of ladies and gentlemen separating after dinner was abandoned by smarter hostesses. 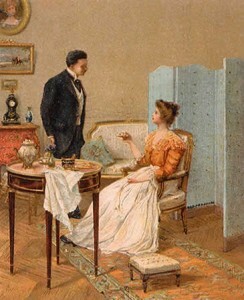 Dinner ended in town about half an hour after the gentlemen joined the ladies in the drawing room. In the country, it was common to begin games or play cards into the wee hours of the night. 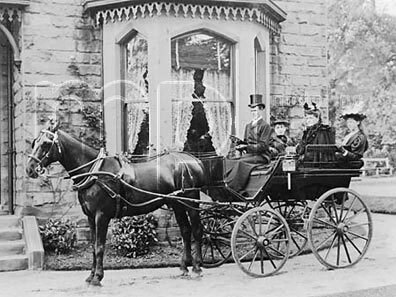 There was no etiquette for leave-taking, and after the host and hostess saw each guest into his or her or their carriages, their duties were done for the night. The evolution of formal dining begins in the medieval era, where dining became a sign of social status. At that time, the table setting included the Salt Cellar, which was the first thing put on the table. The salt was far more than a condiment–to sit above the salt was to sit in the place of honor, and until the salt was put upon the table, no one could know which seat would be allotted to him or her. Then came the silver dishes for holding vegetable or fish, sometimes meat, and small loaves of bread. Spoons and knives, however, were not furnished by the host, but were brought by guests whose servants, so equipped, cut the meat and carved the food for each person. The guests also had no plates or forks, and few knives, but ate with their hands and threw the refuse on the floors. The cleanliness of the cloth, or Nappe, was of paramount importance and a matter of great pride. As the nobility began to express its wealth in its silver trenchers, wassail bowls, ewers, lavers, basins and other implements, and other tools of the table, eating became less egalitarian and the classes stratified based on their table settings. Spoons were now brought by guests, and these elaborately designed silver utensils were often gifts of one of the sponsors at baptism–a practice that most likely spawned the phrase “born with a silver spoon.” Forks came later, and their introduction produced much criticism, with the objectors opining that “fingers were made before forks.” The fork came from Italy, and the early 17th century correspondence of Thomas Coryat cites the new discovery as almost as important as the discover of America, and causing far more discussion. 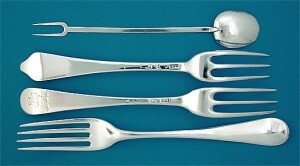 By the reign of Charles II, forks were in common use. The fork did much for the simplification and advancement of culinary art by encouraging the taste for solid viands and natural flavors. The use of the fork also made possible the delicate slice instead of the gobbets of meat of the century before; also, the fork promoted cleanliness at the table. 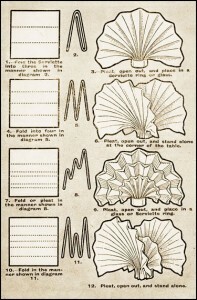 It subsequently made possible choicer table linen, finer clothes and handsome napkins, and there soon developed definite rules for folding and laying the napkin (there was published diagrams showing twenty-five ways to fold a napkin!). 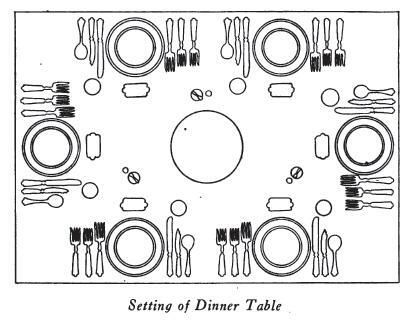 Knives, forks, spoons, platters, ewers and basins created a custom for a more dignified setting of table, and with these new table appliances, manners improved and culinary art advanced to higher standards–the better to fit the richer and more elaborate table setting and silver service. By the 18th century, more attractive and stately service were developed, and silversmiths were set to work to achieve higher and higher standards of art in metalwork. Finer woodwork and other metal works developed concurrently with silverware, and as the wealthy, the noble, and the royal began to fill their houses with costly, exquisite goods, their table settings became more elaborate and dining became a pageant in its own right. Vast, elaborate meals became a way to assert power, wealth and status, and this practice moved the aristocracy and royalty back into public view. But this time, with the arrival of the Dutch practice of alternating seating for the sexes, women sat at the table on equal footing with men. Service à la française, whereby separate courses were created rather than two or three courses, where everything alike was lumped together, took hold of the gustatory habits of the wealthy at the turn of the 19th century. This imposed new rules on the order in which food was to be served: the theories of Carême and Brillat-Savarin felt that the foods’ relationships to one another were an important element of the dining experience, and both believed food should be served in this order: soup, fish, meat, game, sweets and fruits, and the side dishes were to complement these main items. This method was better than the previous methods of serving diners, but it was difficult to keep the dishes hot by the time they reached the table from the far-away kitchen. Because of this, service à la française was rendered impractical, making room for service à la russe, or service in the Russian style, which was brought to France in 1811 by the Russian ambassador. However, this style of service did not catch on in England or America until the 1860s and 1870s, where the English style of service (where all the food belonging to one course is placed in suitable dishes before the host/ess and is served from the table) was more prevalent. With the Russian style of service, there was greater emphasis on the presentation of both meals and place settings. Now, when guests arrived to be seated for dinner, there were place cards designating where one would sit, a menu provided from which one would choose the dishes to eat during each course, and rather than sitting to a table laden down with chafing dishes and platters of food, there was a simple “cover,” which consisted of the plates, glasses, silver and napkin to be used by each person. With this new emphasis on table setting, as with the influx of the newly rich knocking at the doors of the upper classes giving rise to etiquette books, service à la russe created a set of rigid, correct rules for cutlery, china and table adornments. The table now cleared of food, table setting blended four elements of design: central decorations, flowers, color, and mirrors. 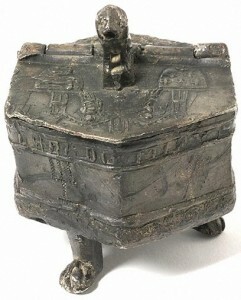 Central decoration usually consisted of epergnes or plateaus, the latter of which was a raised mirror, often with silver or gilt decorations on the raised sides, while the former was a tall stand with hanging arms that held either baskets of sweets, or platforms that held glasses containing sweets. The custom of placing flowers on the dining table began in the early 19th century, but by the turn of the 20th century, the use of a heavy candelabra and elevated dishes alternating with low dishes took hold. Large masses of flowers covered the table, nearly crowding out the place settings, and the individual places were often delineated by strands of ivy or other flowers strung between each cover. 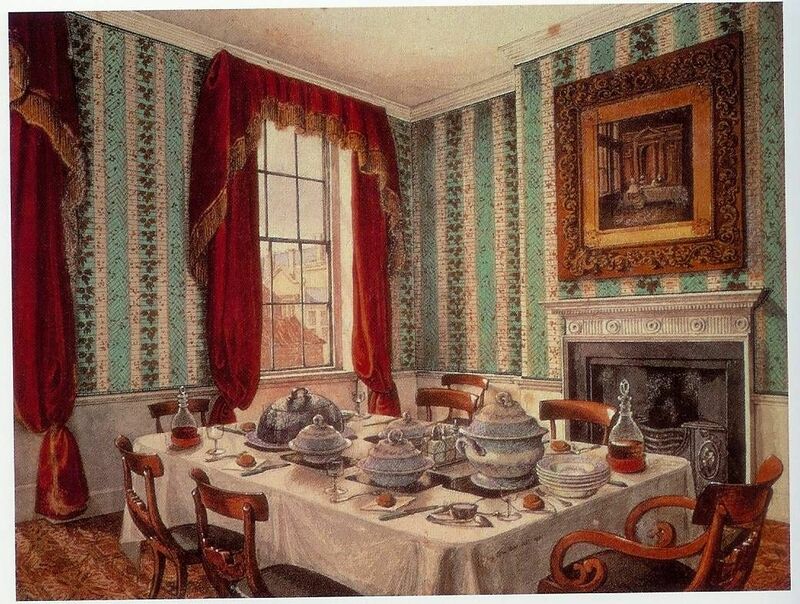 Color was important to the early- and mid-Victorians, and colored table runners, color glasses such as green hock glasses or ruby-colored wine glasses, added a deep splash of color against the already crowded table. Added to this were mirrors, which generally reflected peaceful scenes if a mirrored plateau with figures was not being used. The Edwardian era saw a streamlined table setting, where the table was cleared of the masses of flowers and other accouterments in favor of a simple arrangement of candelabra, bowls of fruit and flower arrangements set one after the other along the length of the table. Now, instead of candles, small lamps, shaded by delicate lampshades, cast an intimate glow across the dining table and its diners. Beneath the table decorations lay the more important articles of gastronomy: the tablecloth, the dishes, and the silverware. Maids setting the table for dinner were instructed to first lay the silence cloth (of double-faced cotton flannel, knitted table padding, or an asbestos pad) upon the table, then to lay the covers, allowing 24-30 inches from plate to plate. If the table was bare, the covers were marked by plate doilies. A service plate was then laid for each person, one inch from the edge of the table, and this plate remained upon the table until it was necessary to replace it with a hot plate. The silver placed in the order which it was to be used, beginning at the outside and using toward the plate. Silver for the dessert course was never put on with the silver required for other courses, except for the dinner that was served without a maid. Neither was the table set with more than three forks. If more were required, they were placed with their respective courses. The salad or dessert silver was brought either in on the plate, or placed beside a napkin or tray at the right, from the right, after the plate is placed. The knife or knives were placed at the right of the plate, half an inch from the edge of the table, with the cutting edge toward the plate. Spoons, with bowls facing up, were placed at the right of the knife, and forks, with the tines turned upward, at the left of the plate. The spoon for fruit or the small fork for oysters or hors d’œuvre was placed at the extreme right or on the plate containing the course and the napkin was at the left of the forks, and the hem and selvage was required to parallel with the forks and the edge of the table. The water glass was placed at the point of the knife, the bread-and-butter plate above the service plate, and the butter spreader across the upper, right-hand side of the bread-and-butter plate. Salt and pepper sets were placed between each two covers. During the heyday of service à la française, the sideboard was used to hold all extras required during the service of the meal. The serving table took its place when the French service was replaced by the Russian, and the sideboard was used for decorative purposes only, usually holding choice pieces of silver. Besides this new emphasis on table setting, the most important and enduring development derived from service à la russe was the matching of dishes to wines. Before, diners would eat and drink wines to their own tastes, but the Russian service, with its sparser table, made it logical to serve a particular wine with each course. Due to this new protocol of complimentary food and wine, the types of and numbers of wine glasses the diner had to negotiate grew. Now the opening oyster course was to be eaten accompanied by Chablis, the soup and also the hot hors d’œuvre with sherry, fish with hock, removes and entrees with champagne, the meat with burgundy, game with claret, and dessert with port, Tokay, or other fine wines. Cocktails later joined this group by the turn of the century, though the practice of having a cocktail before dinner did not emerge until the 1910s. Needless to say, though the formal table setting has simplified much since the 19th century, the array of flatware, dishes and glasses remain formidable and continue to impose a barrier between the wealthy and the middle- and lower-classes. From this evolution of formal dining, we can see that though most do not dine with such elaborate courses or settings, the interest in food and eating has not abated in a thousand years. The issue of “society” created much embarrassment in the formative years of the Government. America had been founded as a democracy, yet to operate smoothly, there existed social and official rankings between Americans and foreign diplomats. Having no cabinet to whom he could turn for advice, President Washington submitted the subject to VP John Adams, John Jay, General Alexander Hamilton and Rep. James Madison, whose prominence and expertise in official and social life rendered them competent advisers. The gentlemen then formed a basic coded of manners to govern the official and social surroundings of the Executive office. To the simplistic ideas of Washington’s impromptu “Cabinet,” Thomas Jefferson, fresh from Paris, added an aristocratic touch to social life, however James Madison and John Adams reverted to the more democratic “American” mode of etiquette and ranking, which has characterized social life in Washington throughout the history of the district. 1. The Official Class, embracing all three branches of the Government, Presidential appointees to administrative departments, and includes officers of the Army, Navy and Marine Corps on duty permanently or temporary at the Capital, and civil officers of the Government whose places of employment are in the different states of the Union or officers of the Diplomatic or Consular services of the US and visiting the city. 2. The Quasi-Official Class, which embraces the Foreign Diplomatic and Consular Corps, Officers of Foreign Governments, and Officers of State or Municipal Governments in the US, in the city. 3. The Unofficial Class, which includes residents from other localities, sojourners or visitors to the city who are entitled by social status at home to recognition in good society, and permanent residents of independent means or engaged in professional or mercantile affairs. The social and domestic routine of Washington is regulated and controlled entirely by official duties. The day was divided into two parts, socially speaking; all that portion before the dinner hour which is after the close of official hours, being regarded as morning [3-5 PM, no later than 6 PM], and that portion of time thereafter as evening [8-9 PM]. Hence, in afternoon receptions, it was generally customary to say good morning, although it was really afternoon (applied only in conversation. In notes and invitations, the usual divisions of time were used). Informal calls between friends and acquaintances, or those doing business, were generally held between 10 AM and 12 PM. The strictest piece of etiquette it was fatal to fail was that of paying calls. The routine was rather different from that of society in other cities, and could put a newcomer into quite a tangle! For example, everyone in official life was required to call upon the President and his wife, but they never returned them unless the caller was a Sovereign, Ruler, or fellow President. A stranger of distinction visiting the Capital was required to make their first call upon a resident official of equal rank, while a newly appointed official, of whatever rank, made the first call of office to the branch of the service or department to which the official belonged. For the stranger arriving in Washington, a simple call–that is, leaving cards for people one wished to know, or tell you were in the city–was sufficient. Amusingly, unlike any other city in America–perhaps even the world–men called on one another more than women were required to! The Official, or Fashionable Season at the Capital began with the general receptions at the Executive Mansion and by the Cabinet Ministers on New Year’s Day, and it terminated with the beginning of Lent. During Lent, as a rule, there were no important public dinners, though quiet dinners and less conspicuous social gatherings were indulged in by some. The Congressional Season, when entertainments and amusements peaked, began regularly on the first Monday in December, and usually ended with the session, or earlier, when the session protracted into the summer. From June to September, owing to the heat of summer, prominent members of the Government and residents generally left the city on their vacations. The formal social demands led to the creation of Receptions. As a rule, these began and ended with the Season, and comprised of two classes, and certain days were set apart for the “At Homes” of the female relations of Washington’s officials. 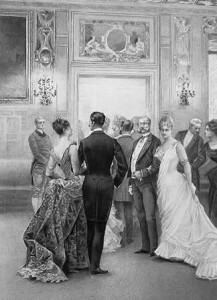 The first class was the Afternoon Receptions, or Drawing Rooms. These required no invitations and were held between three and five P.M., to which all persons of reputable character and becoming dress were admitted. 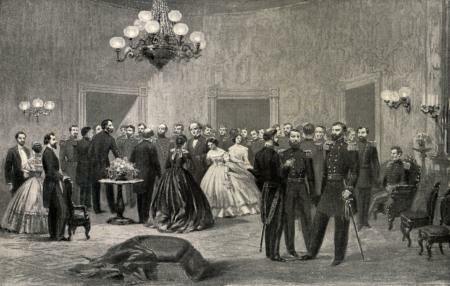 Excluding the President’s Levee, Evening Receptions required an invitation, unless otherwise announced in the newspapers. As a rule, these w ere given by the Vice-President, Senators, the Speaker, Representatives and Members of the Cabinet who entertained, and sometimes were hosted by distinguished private citizens. An evening reception lasted three hours, from eight to eleven P.M., and the gentleman of the house was always present, and received with his wife (or designated hostess) and any other whom she invited to assist her. Due to the transient nature of Washington D.C., it was a natural battleground for social climbers to receive the social recognition denied them by their hometowns. 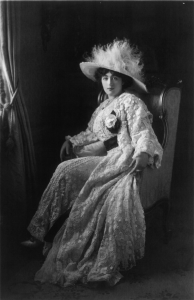 Rather akin to popping over to Europe to mingle with the aristocracy, nouveaux riche could meet the titled and well-born without leaving the States–and a few international matches were made in Washington D.C., the most well-known being that of Belle Wilson (of the “Marrying Wilsons”) and Sir Michael Herbert (“Mungo”), while famous residents who moved to the Capital after being snubbed in their cities included Mary Leiter of Chicago, who married George Curzon and became Vicereine of India, and Evalyn Walsh McLean (left) of Colorado, the last private owner of the unlucky Hope Diamond.